1. Preheat the oven to 200˚C, gas mark 6. Cook the courgettes in boiling water for 5 minutes then drain. 2. Mix the tomatoes, mascarpone and garlic together and place in an ovenproof serving dish. Place the courgettes on top and season to taste. 3. 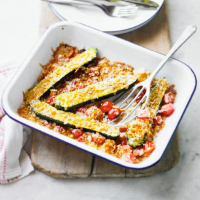 Mix the cheese and breadcrumbs together and sprinkle over the courgettes. Bake for 15 minutes then serve. This recipe was first published in May 2013.